Tesco, the British supermarket chain, is connecting with customers over the Halloween season with “Spookermarket”, an advertising campaign featuring a scary shopping experience. 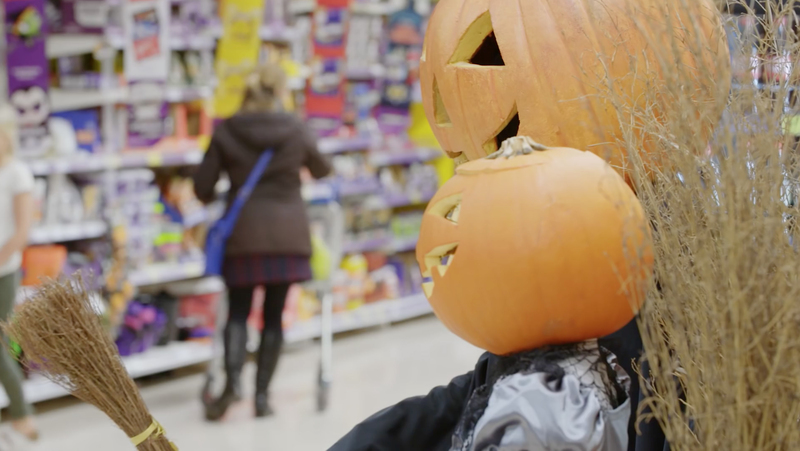 The online film at the heart of the campaign shows customers in a Tesco supermarket being spooked by live scarecrows, a remote-controlled trolley and surprise appearances from scary characters, all caught on hidden cameras. Viewers are directed to four 40 second videos that demonstrate how people can make a petrifying pumpkin, a chilling severed hand, a horrible head in a jar, and paint a creepy clown face. The Tesco site has been loaded with Halloween Spookfest A Night To Remember with ideas for Fang Tastic Fancy Dress, Spooktacular Pumpkins, Gory Food Inspiration, and Haunted Parties. The Tesco Halloween campaign was developed at BBH London by creative directors Matt Moreland and Chris Clarke, creative Kate Murphy, strategist Damola Timeyin, strategy director Ben Shaw, analytics lead Saskia Jones, business lead Holly Ripper, project lead Alex Walker-Sage, account director Stephen Jones, account manager Jemma Marriott, community manager Tom Cauvain working with Tesco marketing manager Claire Hoey. Filming was produced at Black Sheep Studios by director David Stoddart and producer Anthony Taylor.